After 3 years of hard work, allot of research, help from Family, a sacrificed social life and many freelance projects to pay off this research. 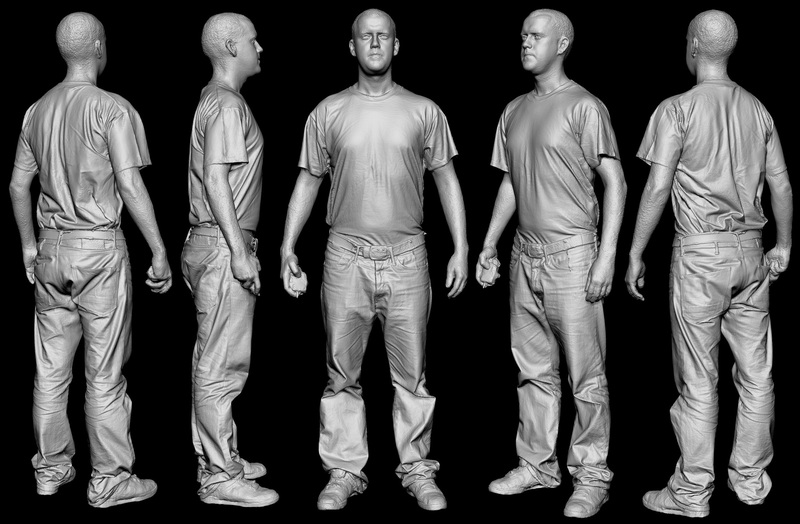 I have finally finished the 2nd iteration of IR’s Fullbody Scanner. 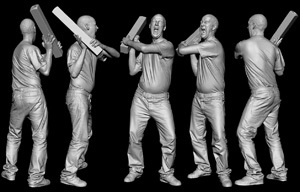 Back in 2002 as a young 3D Environment Artist I could only have ever dreamed of owning my own ‘Laser’ Scanning System. I had no Character Artist Experience, ZBrush was just a 2D painting tool. I was in debt and had no business. But in 2007 that all changed …starting my own business was a gamble but also a fortunate move, it opened up new doors to things I had never imagined. My point.. if you keep trying you can achieve bigger and better things. The system boasts 70x DSLR Canon Cameras. It’s a Single Shot system from a full 360 Degree Array. Not only can the system capture a single moment in time instantly but it offers over 1,260 MP’s of colour texture resolution. So in this blog post I wanted to show off some example captures (at the bottom) but first I wanted to explain (visually) why this system is better than previous scanning solutions. Of course all of them have their benefits and weaknesses. Times are changing and even this system in a few years will be out dated, but for now there is still time for it to reign. There are now other systems springing up around the World. I’ve seen data from a system in Europe and 2 in the UK. Slow. Wobble. Lots of Data. Slow. Bad for Eyes. Stitching. 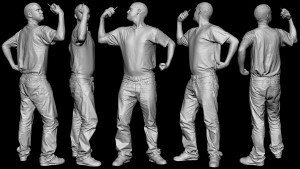 You think of a Pose, IR can capture it. Mid flight! It also has a built in Face Capture System. No manual alignment. No stitching. No seams. No Distortion or Registration issues. Minimal Post Processing. The only draw back to this system is, it isn’t Mobile. The system is vastly cheaper than any structured light or Cyber Scanning systems on the market, and it uses all off the shelf hardware and software, available to the general public. People are asking how much I have sunk into this system, well 50% less than if I had invested in a commercial solution. Do the maths, 70x DSLR’s and Lenses, 70 Mounts, 280 Wires. Multiple PC’s. All this ….and still cheaper. 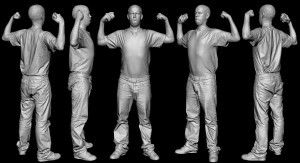 The 3D scan captures below, are only possible thanks to the hard work from the guys behind the processing software at AgiSoft LLC, who created Agisoft Photoscan that I use to process the 2D images. The whole process is very easy to set-up and use, with a little ingenuity and drive it’s possible to get this all working in unison. Thus, contrary to popular belief and sales marketing, you don’t need a PhD to design or use a capture system like this. 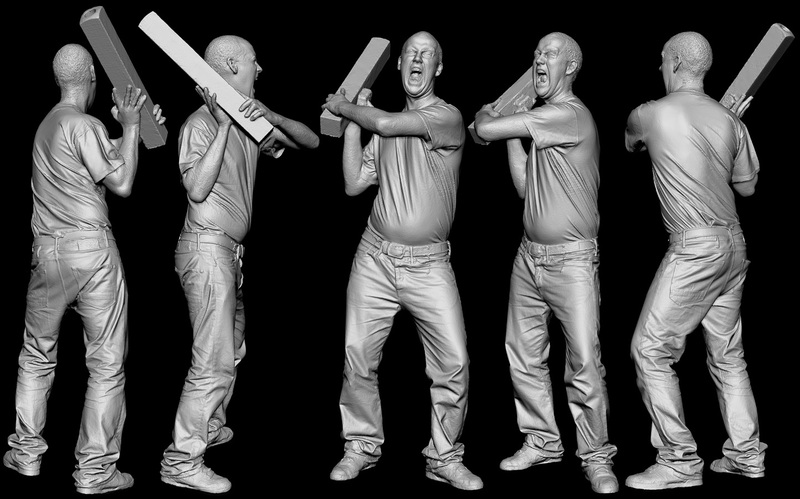 Cracking The Black Box of Photogrammetry Scanning. So awesome. 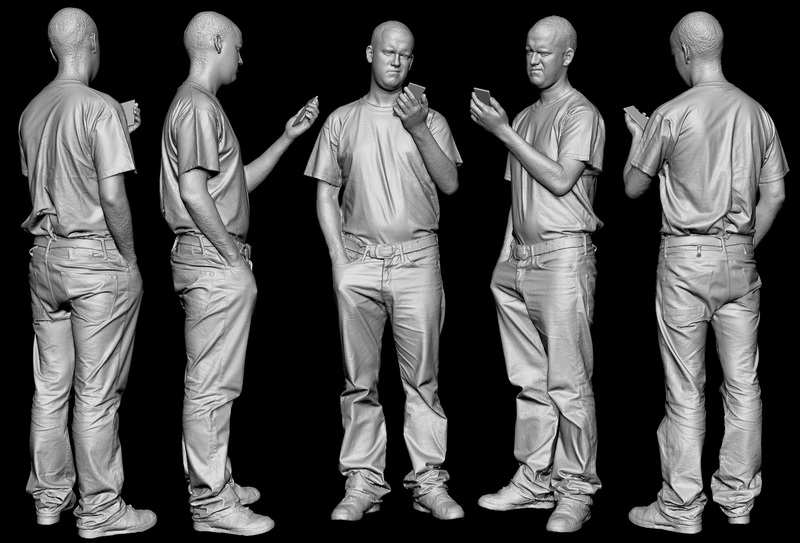 I don't think I've seen any digital sculptors get wrinkles and poses so natural looking. How long is the processing time for these files on your rig? Are you still planning on releasing scans within the next couple of months? Thanks! Processing time varies from 1 hour to 3 hours. I plan to release allot of files soon, just a matter of booking and capturing models. Ha ha! is all true, I used to get head aches all the time from testing that method. You have to close your eyes, no good!! Lee, this is great. Congratulations on your new system. As i mentioned before your blog is a treasure trove of amazing information so im really grateful for you sharing it. Well done again, i love the examples and their fidelity is incredible. Really Awesome!!!! Good Work and Thank you for such amazing stuffs. The results from the 2nd iteration are incredible! Great stuff! Thanks for sharing all your researching; it's extremely insightful. Absolutely amazing! Very inspiring. Got a couple questions...How large is the area inside the circle of DSLR cameras? 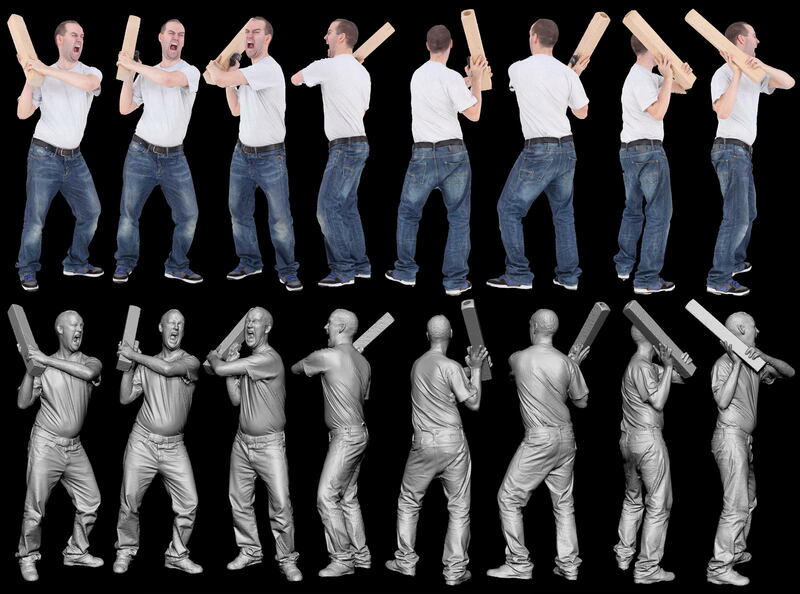 Have you tried object with varying surface materials? Are the DSLR cameras setup with a certain amount of overlap and height? Keep up the great work man...truly inspiring...glad you stuck with it and saw it through to where you are at!!!! 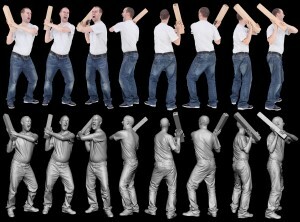 Would the techniques scale up to...say a 5 meter box if one was willing to accept some loss in accuracy? I mean i can see crazy detail in the models that you are generating...i think we are working within 2-3 millimeter tolerences. I just wonder if this is something that may work for us. I'm assuming all the same caveats apply for shiny/reflective and transparent surface materials for reconstructing from the images. The detail in your models is phenominal! Thanks, yeah there are allot of details there and these are only High builds, there is another level up Ultra High, this can extract another hidden level of about 30%-40% extra details. The problem with bringing Cameras further out is loosing actual detail in the images due to distance. If you can replace some of the Cameras with 23MP or 36MP then it would be fine. But 18MP you start to loose clarity because there is not enough information there, so noise is introduced. 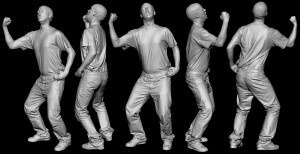 But yes you could do a 5 meter box, I worked on one last year in LA on a Nike shoot (60 Cameras) but allot of noise crept into the scans. Same caveats apply, correct, like in most scanning techniques. Shiny and very dark objects are not good. Although you could introduce some IR (converted) cameras into the array and project in a certain IR wavelength noise pattern. 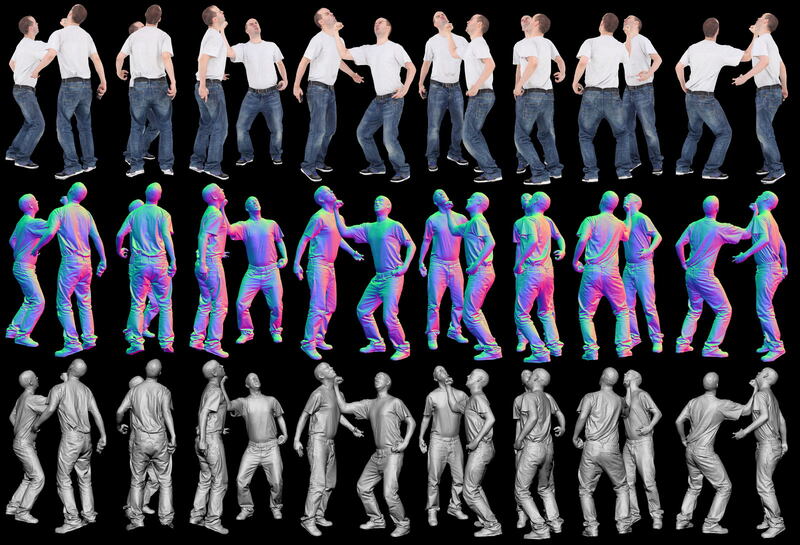 But this is one reason why the Kinect is not great for scanning humans, as the red and infrared wavelength of light is absorbed by the skin (and scatters) but useful for dark objects. Wow Lee, that's just awesome. Love the amount of details you manage to capture. Looks like 20%-40% more detail then other scan data I've had to rebuild models from. 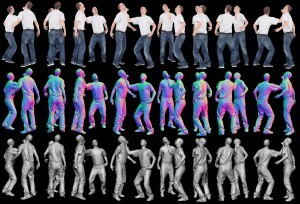 Some of the full body scans I've had look like rubbish. Haha! Thanks for posting Mike. I appreciate that, very good to know. I've been keeping an eye on your thread on CGFeedback http://www.cgfeedback.com/cgfeedback/showthread.php?t=2863&page=9 incredible work and discipline! This is exciting stuff! Does your system require calibration? How does this compare to SK? Thanks George. No Calibration just careful camera placement. This means no orientation, position or scale information but scale can be acquired using markers in scene and the guys at AgiSoft LLC are developing some other control tools for orientation and positional information. You can't really compare between Agi and SK, each have their own benefits. 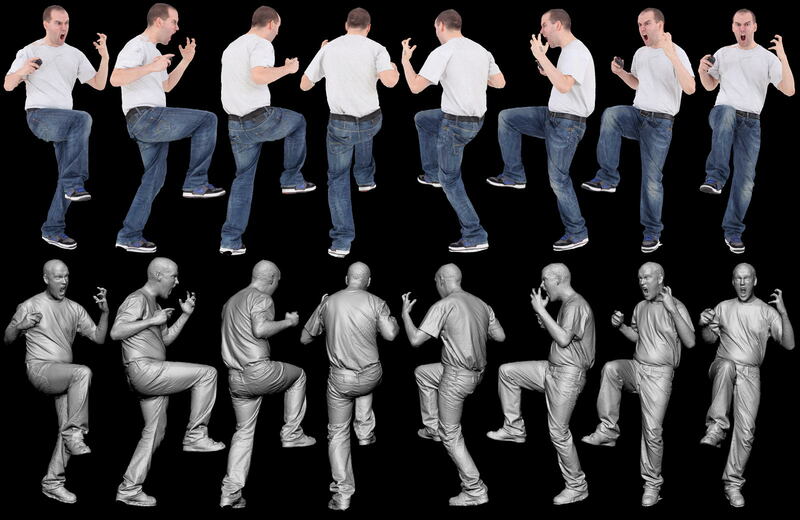 Personally I prefer Agisoft (at the moment) because it produces volumetric based captures, not pairwise. This is definitely great, but 70 cameras...what i have done is took 3D scanning to a new level. 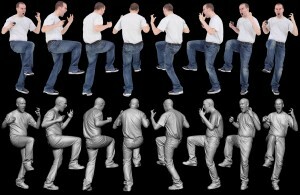 i have found another method and most importantly another use for 3D scanning. 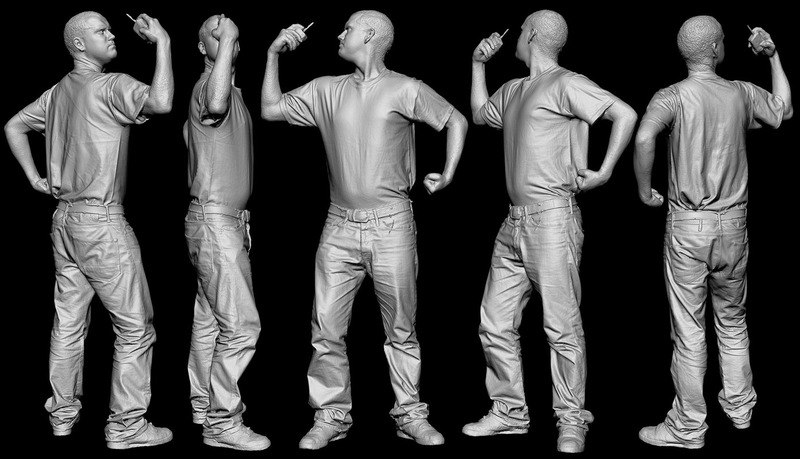 I can not reveal at the moment... but i can say its far cheaper and the market is flooded with 3D scanning devices both expensive and cheap. 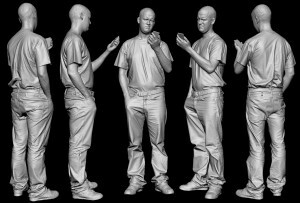 one hard hint I will give "i do not need to produce a 3D object to have a 3D object"...yes that may sound stupid ...and I have several methods and the purpose of my scanning device I can not reveal..that just basically keeps everyone in the dark....this one you would quit your job for. Hi Anshuman, Thanks for your post and kind comments. At the moment I use 550D and 600D with a combination of D800's. White walls = Bounced Light, then no unnecessary green spill. Standard 50mm prime lens, cheap ones. No filter, no need, as it just introduces another level of glass to impact on focus, blur and stop down in light level. 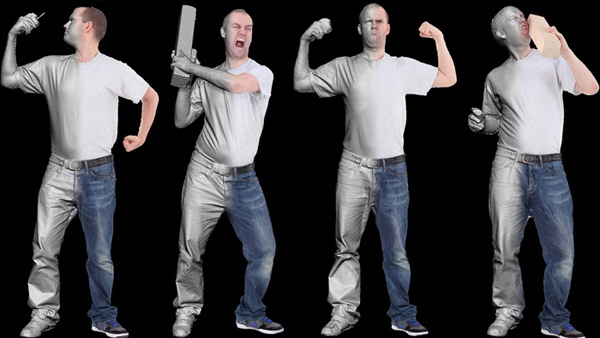 In Photoscan you can Mask by difference. unbelievable....and with 280 cables knitting around - hats off, Lee. Did you consider some MVs with PoE? And with a new Kodak 29MP chip you could make some room in the studio perhaps...to me you are the Leeder of 3D body scanning. many thanks. I'm experimenting with D800's at the moment (36MP) very difficult to use multi-tethered an at full frame. I would love to build an MV or CCD system but raising the finance is tricky. Trivial to build, tricky to get the $! Can I guess? Same system is 10x more expensive but you need a half number of cameras = 5 times more bucks for better reliability and mobility.... Andreas from Vienna sounds quite desperate - may be he can throw in some good consulting money or organize a fund raising event :- )....entschuldigen Sie mich Andreas...Seriously, do you personally consult the set-up at all or you r spreading your craftsmanship opensourcely? Consulting is a route to take, I used to go the open source route but the market is becoming more competitive now. Other studios are copying the method, so a price has to be put on it to stay a head in business and continue to grow and fund the newer research. 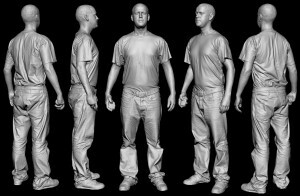 Is it possible to get acurate measurements (like some 3D scaners do - for clothing industry) of several body parts (ex- waist, arms length and grith)? Would you be interested in expanding your business to other countries? Can you help me to construct a system like that in Portugal? Send me an email via the contact form. You will need a healthy budget. You said 'Other studios are copying the method', but I found only IR which is using PS that way. Or other studios are just hiding that from clients. I had situation when I was talking to owner of company which uses PS to get DTM. I saw it's PS but had to talk for 5 min till he own up it' PS. Dunno why..? There are various other studios, they just don't talk so much about their methods or show much public information of their rigs. Many other studios are copying the method though. Really like what you are doing here! This is amazing. Thank you for sharing your work!!! 1) Which version of AgiSoft will work? or do I need the more expensive version? for remote control to take the simultaneous pictures? Camera angles to not wash out the opposing camera positions? Thanks. This is what I offer a consultancy service for. I don't give out too much free information these days, as many companies have exploited the information for financial gain. So I now have to charge. Exactly what I am looking for! I do CNC woodworking and this is a great way to get the real life appearance I am looking for. Do you sell the system or just services? Definitely tough for me to send architectural items/models to the UK from the U.S. Thanks yes. Feel free to get in contact via the contact form to talk further. Your scans look awesome!! Are you going to be selling scanned people at any time? We will be selling head scans for sure no body scans for the time being.